The National Hockey League Players' Association (NHLPA) announced Thursday that the Lester B. Pearson Award is being reintroduced as the Ted Lindsay Award. The Award honors Hall of Famer Ted Lindsay, an All-Star forward known for his skill, tenacity, leadership, and for his role in establishing the original Players' Association. The players' accolade will continue to be presented annually to the "Most Outstanding Player" in the NHL, as voted by fellow members of the NHLPA. "This is a great honor to have bestowed upon me," Lindsay said. "I took great pride in my hockey career, both on the ice competing towards a championship with my teammates, and off of the ice for the work that we did to ensure our fellow players enjoyed proper rights and benefits. I am very proud and appreciative that the most outstanding player each season, as voted by his peers, will receive the award with my name on it." Lindsay played 14 of his 17 NHL seasons with the Detroit Red Wings, spending the three other seasons with the Chicago Blackhawks. In 1,068 career games, he scored 379 goals and 472 assists for 851 points, and 1,808 penalty minutes. In 1966, Lindsay was elected to the Hockey Hall of Fame. His No. 7 was retired by the Detroit Red Wings in 1991. Lindsay won four Stanley Cups with the Red Wings (1949-50, 1951-52, 1953-54, and 1954-55), captaining the club for the last two of those championships. "All NHLPA members, current and former, owe a great deal of gratitude to Ted for his efforts, so it is only fitting that we name our most outstanding player award after him," said Jarome Iginla, 2001-02 Lester B. Pearson Award winner. "The Ted Lindsay Award is a prestigious honor that will continue the tradition set forth by the Lester B. Pearson Award." 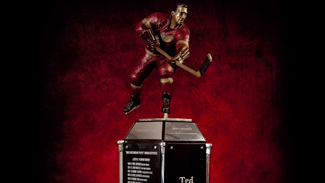 The Ted Lindsay Award will be presented at the 2010 NHL Awards Show in Las Vegas on June 23, 2010 to the 2009-10 recipient.